ICANotes features a user friendly patient scheduling solution which allows you and your staff to manage appointments efficiently, whether you are a multiple or single practitioner facility. Scheduling and managing appointments is easy and fast. The ICANotes Calendar allows the front desk to indicate when a patient has arrived and facilitates collection of the patient's copay. The clinician can go right from the Calendar to the patient’s chart, or start the session note right from the appointment. An appointment history for the patient which lists canceled appointments and no-shows is easily created. 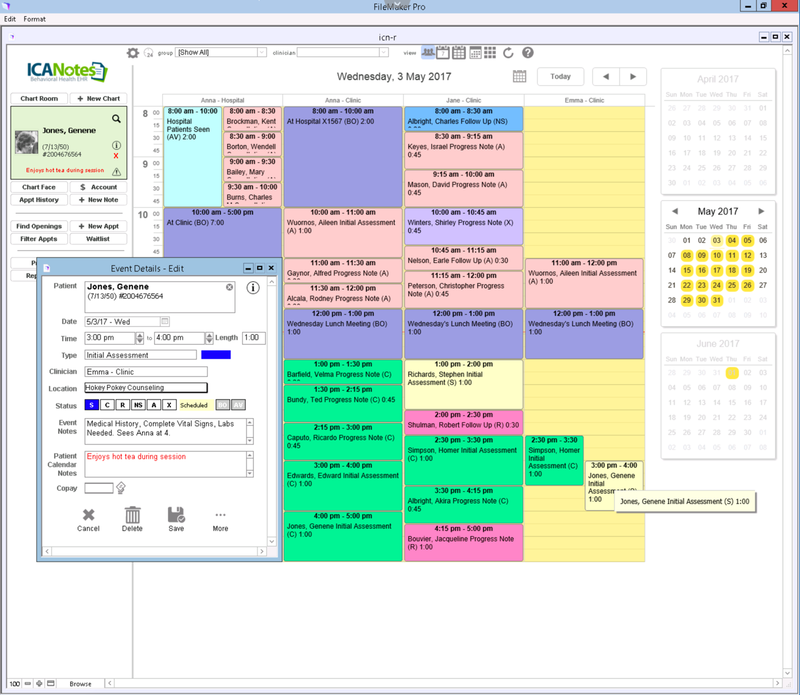 Groups can be scheduled as can block out and availability times. The Calendar also allows you to view multiple clinicians on one screen to compare calendars and reschedule appointments quickly. The ICANotes calendar is integrated with our Patient Portal and our email and text appointment reminders.